The Ashley Graham X Marina Rinaldi 2018 Capsule Collection! Ashley Graham and Marina Renaldi are teaming up to bring us a capsule collection this Spring 2018! It’s debuting Friday during Milan Fashion Week! Are you ready?! Girl. Ashley Graham is on fire… seriously. You’d have to have been living under a rock to not know who Ashley Graham is! After her success of being the first plus size model to grace the cover of Sports Illustrated, she’s become a household name! From her swim collections with Swimsuitsforall to her Addition Elle lingerie collections, we’ve seen and fell in love with her design eye! And when you pair Ashley Graham with one of the leading plus size luxury designers, from the Max Mara family, Marina Rinaldi, (who is no stranger to The Curvy Fashionista) magic is bound to happen! 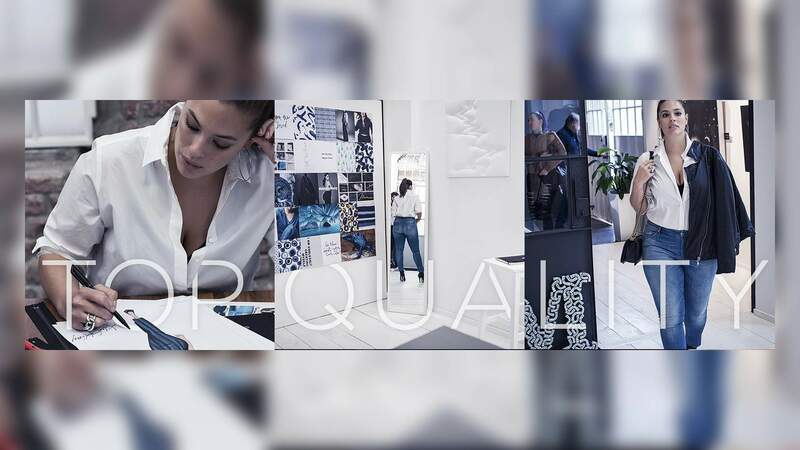 The Ashley Graham x Marina Rinaldi Denim Collection! Thanks to a tip from Estrella Fashion Report, we had to check it out for ourselves! We found all the details about this Ashley Graham x Marina Rinaldi collaboration! The supermodel, designer, and author is teaming up with Italian luxury plus size designer, Marina Rinaldi, to create a capsule Spring 2018 collection! And get this! The line will debut on September 22 during Milan Fashion Week, in their show entitled, “Let’s Denim,” and the collection will be available for purchase in January 2018! Can we talk about this jumpsuit? I need this. STAT. The pair has worked together before — as Ashley has been the face of Marina’s designs for years; so this collection collaboration is a match made in fashion heaven! “The capsule collection starts at $180 dollars. It includes a practical lineup of shirts, dresses and body-hugging pants as well as strapless jumpsuits and motorcycle jackets, with metallic details with Graham’s signature,” via scoop from WWD. So, you have until January to get your coins together! Curious about the brand? You can peruse the current collections at MarinaRinaldi.com! This is so exciting! I’m looking forward to seeing the pieces! Ashley knows how to work her curves, so I’m sure she and the Marina Rinaldi team have worked hard to make sure other curvies’ best assets are on display in a comfy way! So if you are looking for elevated plus size fashion, then you have to check out this collaboration! What do you think of this new collab? Will you be having your eyes peeled for Milan Fashion Week “Let’s Denim” show pics like me? Good! Maybe she can help them avoid the “snooze factor” that their fashion offerings seem to cause in me…. I could get into this!